“Sopas” is a Filipino term for soup and is one of the favorite merienda of the Filipinos. Basically, this chicken sopas is a creamy soup with elbow macaroni, butter and of course the chicken meat. There were lots of variation of this sopas, but the most popular is the one with milk. 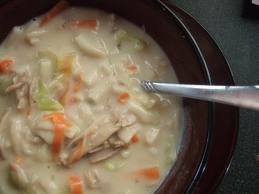 This “chicken sopas” is also good a comfort food and a perfect soup during cold rainy days. Together with the previously mentioned ingredients are the different vegetables such as red bell peppers, carrots and celeries. If you want to add more vegetables on the soup, feel free to do so. But make sure it will compliment the taste of the soup. Moreover, to add more color to the soup, almost all of those who cook this usually add some red hotdogs. To achieve a great tasting chicken sopas, just follow the given instructions below. Since this soup includes chicken (a good source of protein), elbow macaroni (a good source of carbohydrates) and veggies, we can say that it is already a complete meal. So if you want to cook a complete meal, but doesn’t have much time, this soup is perfect! So, what are you waiting for! try this recipe now and may you have a wonderful cooking!